Less Than Three Hours Until Shoetopia Opens Its Doors!! So I’ve just woken up after finishing my last RL night shift for this cycle. I’m off until Tuesday..so plenty of time to get into Shoetopia, right?Let’s be honest, it’s not going to happen. The event is going to be packed to the rafters for the majority of the fortnight run, and judging by the quality on display I’d say that’s rightly so. Elysium Hynes has pinned practically ALL THE THINGS again, so you can use her Pinterest board as a reference guide to what treats lie in store. All bases are covered, with many different styles of shoes; Courtney Stoddenesque towering heels, classic pumps, wedge heels and a fabulous selection of mens styles are all on display. This is what her pinboard looks like, you can see it by clicking HERE. Looking at Ely’s pins I’m just blown away by the imaginative designs and fabulous finishing. 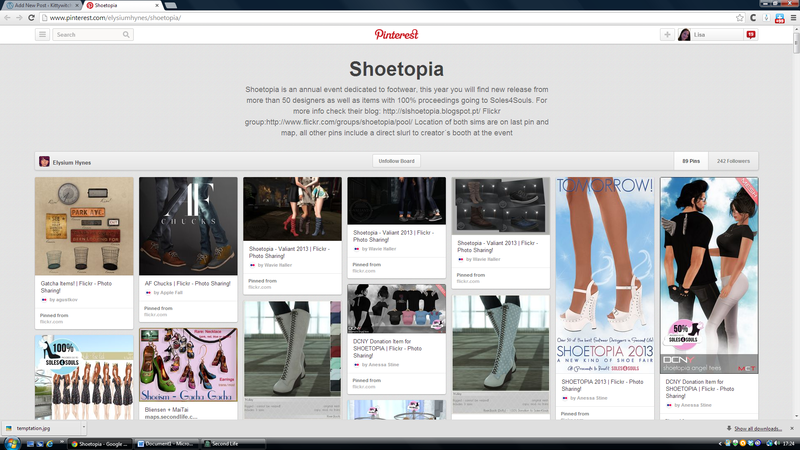 SHOETOPIA is the kind of event that makes you PROUD to be in Second Life, and we have had a LOT of those this year. But don’t despair when you bounce along the sim borders, desperate to find your way inside. You can sort of get your shoe fix by joining the Shoetopia Demo Group. What I am doing at the moment is trying on all the shoes to determine which ones I am interested in buying. Doing this in the comfort of your own home, before the event, makes perfect sense. There is nothing worse after all than buying some gorgeous shoes only to find that actually, they don’t fit and don’t look as good as you’d hoped. Using Ely’s Pinterest as a cross reference, I’ve been looking to see if the demos of the shoes that I’m interested in are in the demo group. If they are, I’m trying them on for size.. These are actually the first pair I tried on. They’re the ADJUNCT ‘As Above, So Below’ boots and as any Witch will know, that phrase has particular significance, so I simply HAD to try them on first! They’re pretty swish. I zoomed in and out, took my time while sizing them and adjusting to find my perfect fit and yup, these are definitely on my ‘MUST BUY’ list, although I’ll be opting for black rather than purple. That said, the purple color really shows the great texture and pattern on these boots doesn’t it? To get even more of a shoe fix, keep your eye on the official Shoetopia Flickr. A final note; it goes without saying, and it’s certainly something that I’ve spoken about before, but please be considerate to fellow visitors at this event. By that I mean dress down, remove scripts and generally be an all-round good egg. I fear that the popularity of this occasion is going to inevitably cause problems by way of sim restarts and lag, so anything that we can do to help is a bonus. Last but not least, this is an event contributing to an amazing charity, so be generous, but most of all, enjoy yourselves! This is going to be FUN! Shoetopia 2013 opens its doors at Noon SLT (20:00 UK TIME!) and runs until November 30th. Kitty’s Getting Ready For Shoetopia-ARE YOU? Has Project Interesting Impacted Your Second Life?